There are actually so many things to blog about. I could write a thousand words on running a business; all it’s ups and frustrations. I could write an update on the tiny house, which is an excellent way to live, minus the hassle of on-going construction. I could write a book on society where it stands (maybe I already have), personal beliefs, or the way I have found some people’s interactions to be negative and knit-picky. I guess that would be called a rant instead of a blog post, or maybe a ranting blog post; so I’ll hold off on that for the time being. I have been working on my lovely new book. This one doesn’t have chapters, it is broken up into three parts. It is developing quite nicely. My internal compass, usually pointing me in a positive and romantic direction, has taken over in this case. Recently, I have taken a most enjoyable plunge into the world of songwriting. I have written many poems throughout the years, most of which will never see the light of day, and song writing is akin to that, so the lyricist title is suiting me well. An indie psychedelic rock band has allowed me to help with the lyric writing of their original songs. We collaborated, and dreamed up a song rather quickly. It was quite amazing. I’ll be sure to share it with you as soon as it is available. But, recently, with the camping excursion I went on and the daily need to eradicate stumps and other trash behind my store/studio by fire, I have found myself thinking over, and becoming quite good at building a flame. I, in no way, build a fire every night, although while camping I did most nights. These days, I will have a fire out back twice weekly, which is enough to occupy my mind with thoughts of the dancing flames. How much of life is like a fire! Our relationships with one another can be compared to building a fire. You have to start small, build it, nurse it, protect it, allow it to grow, add fuel, and allow enough oxygen in for the fire to breathe… but not smother. It is a perfect allegory. I have thought of it many times. The way that you have to add more to keep it burning, and can add larger sticks to the fire as the flames grow higher; like the way we often share experiences with one another. 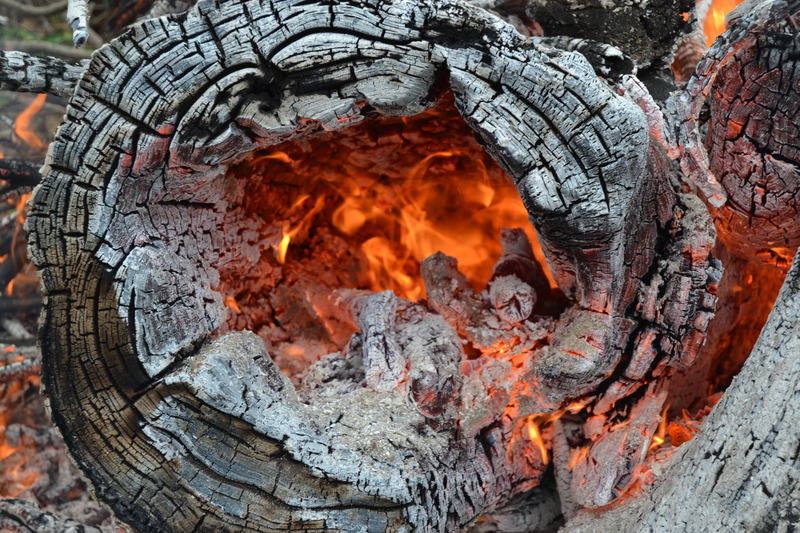 I researched the history of fire, and it brought to mind the early fire-builders who discovered fire as a life-saver; able to provide warmth and sustenance like no other source. Likewise, I think we need one another to provide comfort and friendship, to keep the flames burning between us or the life shared will wither and become as ashes. So, here’s to friendship, relationships, family, fire, and all the good things in life that keep us going. Here’s to the pensive writers who write the things we haven’t noticed, but already know.